The ESIG Product Stewardship Award is our way of recognising excellence and innovation in the use of solvents. European companies that pursue high standards, maintain best practices, and seek innovative ways to produce, supply or transport solvents are invited to enter the competition. Many of the winning companies have found new ways to improve performance related to protecting human health and the environment. Their solutions often go beyond regulatory requirements. The award gives solvent users the opportunity to show their strong commitment to Responsible Care and highlight their achievements to customers, suppliers, regulators, industry representatives and the media. Christiaan Fetter, Member of ESIG’s Product Stewardship Group from LyondellBasell. Oleotecnica is a small Italian manufacturer of solvent-based products with a small environmental footprint. This award recognised their efforts to decrease CO2 and VOC emissions with solar energy and the latest computerised manufacturing process. Oleotecnica’s regular open day events have proved a great way to share best practice and bring the importance of solvents and their safe handling closer to the local community. Hedinger is a German distributor of pharmaceutical grade solvents whose award reflects their excellence in responsible supply chain management. Their dedicated transport and storage facilities have reduced their VOC emissions and kept workers safe. Hedinger also impressed the jury with its regular training sessions to improve handling and for rigorously auditing suppliers. Hedinger’s achievements are easily transferrable within the pharmaceutical industry and should inspire other companies. Multisol Group is a specialist chemical distributor with operations across Europe, the Middle East and Africa. Multisol Group impressed the jury with their extensive work with students to demonstrate the indispensible role of solvents in everyday life. During their visits, students have learned how substances are handled safely and recycled after use. This outreach has helped to improve the perception of solvents and illustrate the many career paths available in the chemical industry. CSC Jäklechemie is a family-owned company in Southern Germany that distributes specialty and industrial chemicals. CSC Jäklechemie impressed the jury with its modernisation programme to improve safety while handling solvents. The company launched a complete reconstruction of its headquarters in Nuremberg, investing in modern plant technology and enhanced environmental protection and safety measures. As a result, they became of the most modern and responsibility aware companies of its type in Europe. Drogas Vigo is a small chemical distribution company based in Spain and Portugal. Their award recognises the major advancements they made in product stewardship after developing a long-term strategic plan. With an investment of €6.5 million, the company was able to use cryogenic technology to reduce VOC emissions, improve storage facilities to prevent environmental leakages and offer customer site appraisals. They also hosted many seminars on the explosion and fire risk from static electricity. Cognis Ireland was a specialised manufacturer of chemicals for the mining industry. Since 2010, it has been a subsidiary of BASF based in Germany. This award recognised Cognis’s new state-of-the-art distillation unit, which minimised waste and environmental impact. The new technology allowed all products to be separated and recovered at the highest levels of purity and resulted in less sludge quantities and fuel purchases. Kartoflex is a trade association representing Dutch carton and flexible packaging producers. 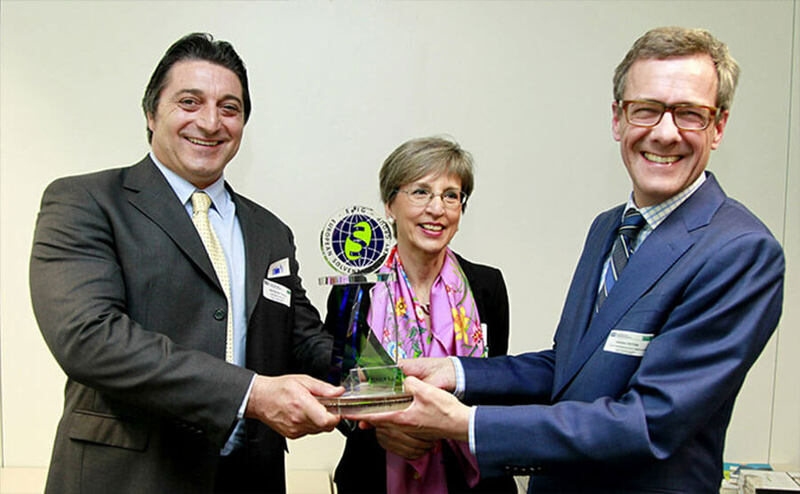 This award recognised Kartoflex’s public-private partnership to reduce worker exposure to solvent vapours in flexography and packaging gravure. In cooperation with the Dutch Ministry of Social Affairs and Employment, they developed comprehensive checklists and guidelines that enabled companies to more easily determine exposure levels and make improvements. Co-Award Category: Best submission from a new EU Member State and Best submission from a small and medium-sized enterprise. Although today Balakom is now part of the Dutch-based AkzoNobel, the company was once the oldest paint and varnish producer in the Czech Republic. The two awards they received recognise their achievements at reducing emissions in the workplace. Balakom developed a step-by-step programme to replace all open pearl mills for producing paints with closed mills that reduce health, safety and environmental risks. PENTA is a Czech company specialised in the production and supply of pharmaceutical and specialty chemicals. This award recognised PENTA´s new production line for tanking, storing and refilling volatile solvents that practically eliminated all VOC emissions. Apart from the great benefits to worker safety and the environment, these improvements also allowed PENTA to reduce costs due to lower environmental taxes and less solvent losses. As a trade association, the British Coatings Federation won an award for its Coatings Care programme, which offered much needed support for responsible care in all aspects of solvents management in the UK. The programme created an Environmental Management Code and Guidance Process that enabled benchmarking and solvent reduction planning. Among other resources, it established Community Liaison Code and Guidance materials to address common neighbourhood and local issues. Campi y Jove is a Spanish solvents distributor whose award recognises their systematic efforts to handle and distribute solvents more safely. The company built new facilities that went far beyond environmental and health standards at the time. Management held their teams responsible for ensuring compliance throughout the supply chain. They encouraged regular visits to advise customers on the latest safety regulations and offered regular training courses to suppliers. Intergraf represents 24 national printing federations in 21 European countries. They received an award for publishing an outstanding set of guidelines on printing with solvents called the Environment and Best Available Techniques (BATs). The guidelines incorporated best practices and insights from an international network of experts, setting a bold and high standard for the industry. As a paints and coatings producer, SOPPEC won this award for designing and constructing a new production site for their special aerosol paints. SOPPEC’s new facilities reduced the environmental impact of their activities and improved the health and safety of employees. The process involved installing fire and gas detection systems and video surveillance equipment as well as designing new safety caps for aerosols. Jowat produces solvent-based adhesives for applications in the upholstery and foam mattress industry. The company discovered that during the application of adhesives, sparks from static discharges could cause the upholstery and foam to catch fire. Jowat won this award for formulating an adhesive with increased solids content that could be precisely sprayed on to reduce emissions. As a result, the risk of flammability was made comparable to water-based adhesives without compromising quality. Brenntag is a European chemical distributor whose award recognises their commitment to protecting air quality. By centralising distribution in a single plant in France, Brenntag was able to reduce VOC emissions into the atmosphere. This central facility enabled solvents to be stored underground in double-walled stainless steel tanks, ensuring any vapours released during loading and unloading operations are captured and recycled. Dow Corning is a speciality chemicals producer, which uses toluene and aliphatic hydrocarbons to produce silicone-based paper coatings and defoamers. This award recognised their efforts to improve production schedules and implement novel cleaning procedures to sharply reduce solvent waste during their operations. Daniel Englender was a small furniture manufacturer based in the UK who received this award based on the company’s commitment to environmental stewardship. Concerned about their VOC emissions, the company invited external experts to review their procedures to apply adhesives containing solvents. As a result of this process, the company decided to switch to spray-gun cleaning fluids that emit less VOCs and can be recycled up to three times before removal. Wictor is one of Italy’s most well known producers of adhesives for shoes, leather and furniture. This award recognised their cryogenic condensation techniques to collect spent solvent vapours for reuse in polychloroprene adhesive formulations. The process enabled the recovery of nearly 100% of the VOCs they emit.